David Brooks: Republicans in Washington Have Struck a Faustian Deal with Donald Trump! “Many Republican members of Congress have made a Faustian bargain with Donald Trump. They don’t particularly admire him as a man, they don’t trust him as an administrator, they don’t agree with him on major issues, but they respect the grip he has on their voters, they hope he’ll sign their legislation and they certainly don’t want to be seen siding with the inflamed progressives or the hyperventilating media. 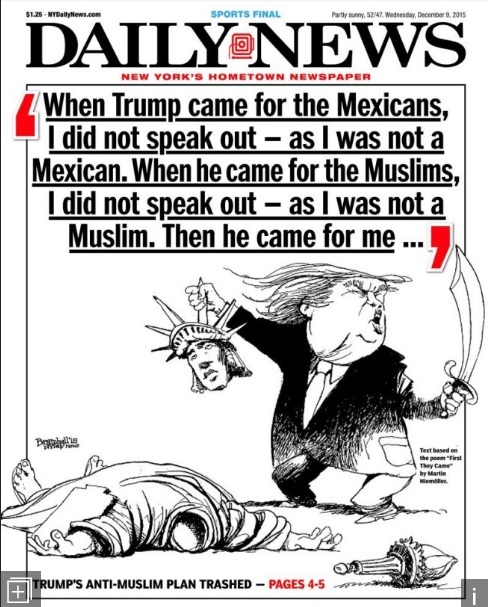 …it is hard to think of any administration in recent memory, on any level, whose identity is so tainted by cruelty. The Trump administration is often harsh and never kind. It is quick to inflict suffering on the 8-year-old Syrian girl who’s been bombed and strafed and lost her dad. Its deportation vows mean that in the years ahead, the TV screens will be filled with weeping families being pulled apart. Brooks says it well. The Republicans have given up their spiritual values! God save us all! Boy Scouts of America to Accept Transgender Boys! Reuters is reporting that the Boy Scouts of America announced yesterday that it would begin accepting transgender boys, bucking its more than a century-old practice of using the gender stated on a birth certificate to determine eligibility. Delimarkos’ cited shifting definitions of gender under state laws, which can “vary widely from state to state,” in explaining the change. Delimarkos said while the organization offers programs for all youths, its Cub and Boy Scout programs are specifically for boys. The change will allow children to apply even if male is not listed on their birth certificate. In 2013, the Boy Scouts voted to lift a ban on openly gay scouts that had been in place throughout the organization’s history. Two years later, the organization lifted its blanket ban on gay adult leaders after its president called the ban unsustainable. Congratulations to the Boy Scouts on this policy change! Hundreds of Education and Civil Rights Groups Oppose Betsy DeVos’ Confirmation! The letter, which was spearheaded by The Leadership Conference on Civil and Human Rights, comes as the Senate education committee is set to vote on DeVos’ nomination Tuesday morning. Among the high-profile groups who are signatories to the letter are the NAACP; national teachers unions the National Education Association and the American Federation of Teachers; the National Council of La Raza; and the Children’s Defense Fund. DeVos is praised by conservative school-choice supporters for her advocacy of voucher programs, and Sen. Lamar Alexander – a Tennessee Republican, chairman of the education committee and himself the education secretary under President George H. W. Bush – has been steadfast in supporting her nomination. But the Michigan billionaire is arguably the most embattled of Trump’s Cabinet picks, and her performance testifying in front of the committee earlier this month was widely panned by education experts on both sides of the aisle and seen as revealing worrisome gaps in her understanding of simple education policy issues. Last week, Senate Democrats vowed to vote against DeVos’ nomination en bloc and have been strategizing about how to recruit three Republicans in order to block her. To be confirmed, nominees need the support of 51 senators – or 50 senators and the presumed tiebreaking vote of Vice President Mike Pence – and Democrats currently hold 48 seats. Protests Mount as Travelers Are Stranded Under New Immigration Policy! The headlines all over the globe are pointing to the disruption caused by President Donald Trump’s executive order issued Friday effectively closing the United States to refugees and immigrants from seven predominantly Muslim countries. The order bars entry to refugees from anywhere in the world for 120 days and from Syria indefinitely. It blocks any visitors for 90 days from seven designated countries: Iran, Iraq, Libya, Somalia, Sudan, Syria and Yemen. Critics at home and abroad see the president’s order as a retreat from traditional American values. World leaders denounced the order, and several Republican lawmakers called on Mr. Trump to back down. “Stay calm, you’re safe here.” That’s the message American colleges have been trying to send to international students in the wake of the executive order, signed Friday night by President Trump, that imposes a travel ban on visitors — including students and other people with valid visas and …..that they can continue their studies uninterrupted. In the meantime, officials advised students not to travel abroad during the 90-day ban. But the soothing words belie deeper concerns. Since the presidential election, educators had been bracing for a “Trump effect” on international students. In a survey of prospective foreign students released last spring, when few gave the Republican businessman strong odds of winning the presidency, 60 percent said they would be less likely to study in the United States under a President Trump. Few campus officials, however, anticipated the sweep of the executive order, which also placed an indefinite-day freeze on refugees from Syria…. Here at the CUNY Graduate Center, one Iranian student was denied re-entry backed to the United States after visiting her parents over the winter break. The Country and World React to President Trump’s Refugee Ban! People around the country and world are reacting to President Trump’s policy putting a four-month hold on allowing refugees into the United States and temporarily barring travelers from seven countries (Iran, Iraq, Libya, Somalia, Sudan, Syria and Yemen). Here is a sample. Canadian Prime Minister Justin Trudeau welcomed those fleeing war and persecution even as Canadian airlines said they would turn back U.S.-bound passengers to comply with an immigration ban on people from seven Muslim-majority countries. Trudeau said in a tweet: “To those fleeing persecution, terror & war, Canadians will welcome you, regardless of your faith. Diversity is our strength. Demonstrators rallied at airports including New York’s John F. Kennedy International Airport, Chicago’s O’Hare International Airport, San Francisco International Airport, Dallas/Fort Worth International Airport, Seattle–Tacoma International Airport, Los Angeles International Airport and Washington Dulles International Airport. The New York Taxi Workers Alliance, a nonprofit that works with the more than 50,000 licensed yellow taxi drivers, called for a one-hour work stoppage at John F. Kennedy International Airport in protest of President Donald Trump’s executive order. A federal judge in Brooklyn, New York issued an emergency stay yesterday that temporarily blocks the U.S. government from sending people out of the country after they have landed at a U.S. airport with valid visas. Following the internal and public statements from the likes of Google, Facebook and Microsoft regarding the Trump administration’s new immigration policy, additional corporations including Apple, Uber, Twitter and Netflix took stances against it. Carolyn Bryant, Woman Who Accused Emmett Till in 1955, Recants Her Testimony! “The woman at the center of the Emmett Till murder case has spoken out for the first time, more than 60 years later, admitting that part of her story about the black teenager is false, a new book claims. Till’s brutal beating death in Mississippi in 1955, the acquittal of his professed killers by an all-white jury and the photos of his dead body sparked outrage outside the state — becoming a catalyst for the national civil rights movement. Authorities say the 14-year-old from Chicago was killed during a visit to Mississippi after Carolyn Bryant Donham, a white woman then named Carolyn Bryant, reportedly accused him of grabbing her by the hand and waist and acting lewdly at her shop. Till was kidnapped days later from a relative’s home and then beaten and mutilated, before being shot, by Donham’s shop-owner husband at the time, Roy Bryant, and his half-brother, J.W. Milam. Till’s body was sunk in the Tallahatchie River, where it was eventually found floating. After a highly publicized trial, Bryant and Milam were acquitted of Till’s kidnapping and murder in September 1955 by an all-white, all-male jury. They deliberated for an hour. Donham testified at the trial and, according to Vanity Fair, her allegations were entered into the record and shared with reporters by her attorneys — but they were not heard by the jury, who had been excused from the courtroom. Donham avoided public attention for much of her life, ignoring journalists’ repeated requests. But she sat down with author Timothy B. Tyson 10 years ago for his new book, The Blood of Emmett Till, according to Vanity Fair and the Austin American-Statesman. “Honestly, I just don’t remember,” Donham said of her fateful meeting with Till, according to the Statesman. “It was 50 years ago. You tell these stories for so long that they seem true.” Donham’s allegation that Till whistled at her has also been disputed. On the stand in 1955, however, Donham claimed Till had said something “unprintable” to her and she was “scared to death,” according to Vanity Fair. Another sad chapter in American history! Gail Collins’ Take on Betsy DeVos! “DeVos is a longtime crusader for charters, vouchers and using federal funds for religious education. She was once the Michigan Republican state chairwoman, a fact completely unconnected to the $200 million or so her family has donated to the party. She’s used all that clout to make Michigan a model of how not to improve public education. “I’m amazed at how many people on the street are saying, ‘Please, don’t let her be in charge of education,’ ” said Senator Patty Murray, the ranking Democrat on the committee that’s considering DeVos’s nomination, which is adorably called Health, Education, Labor and Pensions (HELP). It’s not particularly astonishing that a Democratic senator would hear complaints about a Republican president’s nominees. But it is sort of remarkable how much ire, wrath and terror this particular one is causing. ..
Poor Senator Alexander, who was once secretary of education himself, has an excellent reputation for bipartisanship. But there he was, limiting his members to five minutes worth of questions each and refusing to allow a second round. In the short time allotted, the committee did manage to learn that DeVos doesn’t understand federal laws on educating disabled students and that in all her years working on school reform in Detroit, she has never asked any public school principals whether they had enough resources. We have two problems here. One is that DeVos is obviously unqualified. While it was nice to learn that she “mentors students,” that’s not really a great preparation for running a 4,400-employee organization with a $68 billion budget. She has never actually worked in a school system or managed a large institution — she and her husband became billionaires through the old-fashioned strategy of having stupendously rich parents. DeVos’s big selling point for Republicans is her manic devotion to charter schools. There are, of course, some great charters around the country. But there are also some terrible ones, and she is deeply unenthusiastic about any system that would weed out the losers. This would be the second problem. DeVos seems to be a particularly big fan of for-profit schools. There’s nothing more disturbing about the school-choice movement than its infatuation with private enterprise. Running schools like a business (and, of course, driving away the teachers unions) is supposed to create more efficiency. But mainly, it creates more income for management. About 80 percent of the charters in the Michigan system are for-profit, and The Free Press investigation found that the charters were generally spending more on administration and less on the classroom than traditional districts. Sadly, my prediction is that this time next week we will be discussing Secretary DeVos! 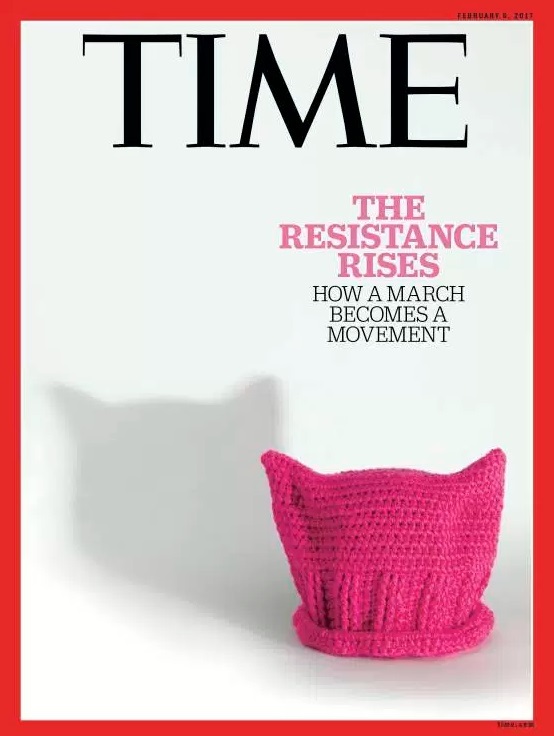 Time Cover: The Resistance Rises! “There is no precedent in U.S. history for the show of collective outrage that answered Trump’s Inauguration. But then, there is no precedent for Trump, either: impetuous, thin-skinned and, for his trouble, entering office facing a grassroots opposition that heated up faster than a cup of ramen. U.S. News & World Report Ranks CUNY SPS 24th Nationally for Online Bachelor Degree Programs! Congratulations are in order for the CUNY School of Professional Studies (SPS). In the latest (2017) rankings of online bachelor degree programs, SPS was ranked 24th nationally by U.S. News & World Report. SPS received an overall score of “84”and a “90” out of a possible “100” for faculty credentials and training. Great work on the part of John Mogulescu, Brian Peterson, George Otte, and all the faculty and staff at CUNY SPS. George Orwell’s “1984” is No. 1 on Best-Seller List! “Craig Burke, the publicity director at Penguin USA, said that the publisher had ordered 75,000 new copies of the book this week and that it was considering another reprint. “1984” was required reading during my high school days. Glad to see it regain its popularity and for the right reasons.